I got my May StrideBox last week; but, with the stomach virus that I had, didn’t really get to look at it until last night. If you are not familiar with StrideBox, it’s basically a goodie/sampler box of running “accessories, nutritional products, and apparel” that you get each month for a $15 subscription. As you can see, the box contained a great variety of products this month, anchored by the great shoe clip! After looking everything over, I’ll definitely use/try almost everything included. Gels: VFuel Endurance. Again, standard item for nutrition, though I am not a fan of peaches, so I will probably pass on this. That said, the differentiators their website describes interest me enough to maybe get a sample pack to try. The kicker here is I really am sold on the “plain” flavor of GU – meaning that I don’t like a conflicting flavor with my electrolyte drink… BL: HMMMM? Box Value? Again, the monthly subscription is $15 and, by my calculation, this month’s sampling totals about $36.27 OTC – a pretty good deal in my book. 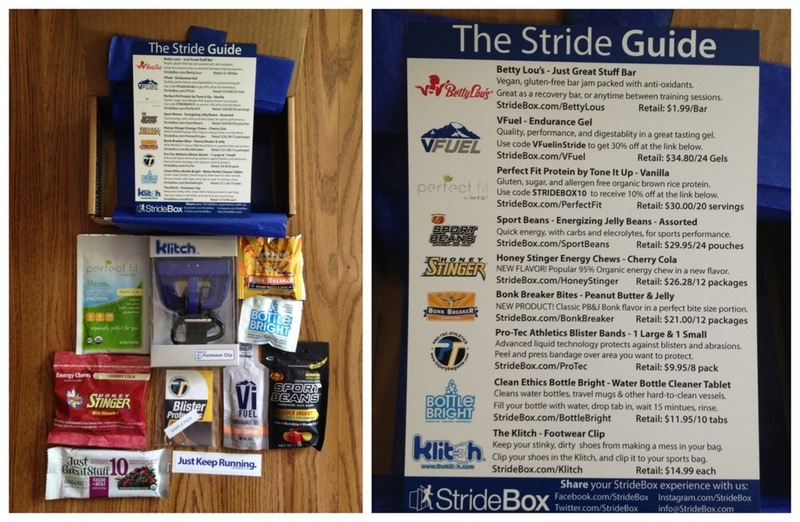 There you have it – StrideBox vMay 2013…and it’s another winner! You can sign up for your monthly StrideBox here! Comments: My knee started bugging me after about a mile. I considered pushing it, but thought I better not with this weekend’s 50K on the horizon. So, I changed this morning to a brisk walk, did a total of 3.38 a 13:32 pace, and am icing the knee today.